As we move into the last year of our third term, we are proud to have served the Boholanos faithfully, continuously and without pause, even as the Boholanos themselves have exemplified the courage, determination and resiliency of Francisco Dagohoy in the wake of may calamities and challenges, most notably the 7.2-magnitude earthquake of 2013 and, recently, the attempted Abu Sayyaf entry in April of 2017. Through all these challenges, I can confidently declare to the world that the Boholano spirit remains triumphant! 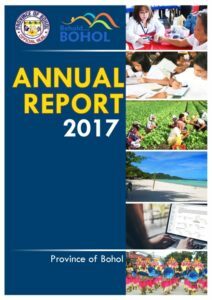 This Annual Report for CY 2017, aside from showcasing an update on the Bohol Earthquake Assistance (BEA) Projects, also summarizes all of our accomplishments in this calendar year. But more than just a documentation of what we have done, this report manifests our love for Bohol through our concerted efforts, always guided by our mantra: InSPIRED HEAT-IT Bohol, representing our development pillars and priorities: Infrastructure, Social Well-being and Shelter, Peace and Order, Interconnectivity, Reforms in Local Governance, Equitable Economic Growth with Environmental Sustainability, and Disaster Risk Reduction & Management/Climate Change Adaptation. We are also grateful for the consistent affirmation of our good governance by external authorities, although we maintain that awards and recognition are not the be-all and end-all of governance. As our term will be ending next year, we are also set on pursuing projects that makes us even more excited, more optimistic, and more determined about Bohol’s future. The top 10 Major Development Projects of Bohol specified in this report are the product of dreams and aspiration of our past leaders and our people. 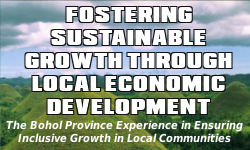 These achievements were made possible because of full legislative support from the Sangguniang Panlalawigan, dedicated Provincial Government officials and employees, active LGU partners and stakeholders, as well as national, regional and ODA partners, whose convergence made it easy to realize the legacy programs and projects for Bohol’s sustainable development.